The blueprint of the dog breed is based upon structure. Skeletal drawings for an illustrated standard demonstrate what lies under the skin and forms the conformation of the breed. 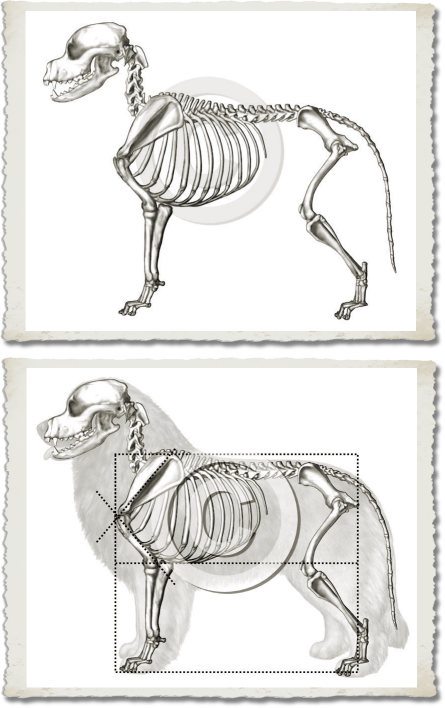 In an illustrated standard, the skeleton inside the dog must fit together properly to support the proportions called for within the text of the breed standard. Every bone in the canine skeleton has a specific purpose and works in relation to the surrounding skeleton. For example, if a shoulder blade is upright, or an upper arm short, it will reflect the limitations in the gait of the dog. The external silhouette of the dog body is dependent upon the length and shape of the spinal column and rib cage, as is the set of the tail and neck when taken in conjunction with surrounding structure. Readily noticeable points of conformation include shape of feet which are effected by the length and relationship of the bones which support them. Each dog has a unique skull which forms the shape and length of the parts of the head, as muscles attach for support and adjacent structure collaborates to makes each dog and breed unique. It is important to know what lies within the body of the dog and to translate that into correct form. Likewise, it is important to know what lies beneath the coat in a breed that is heavily coated or has particular grooming patterns. When judges do "hands on" examinations, they are able to follow the bones of the skeleton and locate the structure, point by point. Grooming does not change the structure of the dog, although it can do much to change the visual impression. Therefore, in coated breeds, it is important to demonstrate what lies beneath all of that coat and forms the true dog. Sometimes it can be surprising. Finalized breed standard drawings may be combined to demonstrate the relationship of structure to outward appearance. Skeletal or overlay illustrations can be used independently as well as within the body of the correct dog. It is helpful to demonstrate the skeleton alone, where it is not obscured, so that the fit of one bone to another can be clearly seen. It is also important to show that skeleton within the actual body of the dog, where everything comes together for a unique fit. All of this enhances understanding in the illustrated standard and reinforces knowledge of the breed. Underlying structure forms the building blocks of dog anatomy in the illustrated standard. Its importance cannot be emphasized enough. The need to use this important resource for judges' and breed education should be paramount in understanding breed type and function.